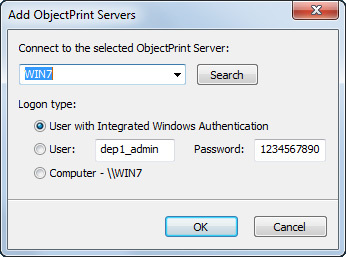 With OP Desktop Client, the user connects to an OP server, which provides information on current user/computer print activities with Integrated Windows Authentication and Host Authentication. As such, it is no longer necessary to enter a name or password into your web browser every time. 4. After the OP Client is set up, it will minimize itself to the System Tray (the bottom-right corner of your screen). To open the program again, click on the icon in the System Tray. 5. OP Desktop Client will start automatically once the installation is complete. 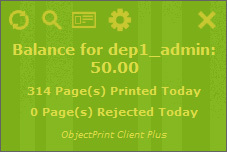 If this is your first time running OP Desktop Client, the software will help you to get started by popping up the Add OP Server dialog. Server Name – Enter a name for the OP Server you are connecting to. Choose Logon type: User with Integrated Windows Authentication, with User name and password and Computer (Host) Authentication. Click "OK" when finished. The program will now test the connection to the Server. If the connection is working, a successful message will appear. If the connection is not working, an error message will appear. You will need to go back and verify your settings. OP Desktop Client uses port 1563 (TCP). This port must be accessible from the Internet on the machine running OP Desktop Client. Open Add/Remove Programs and select OP Desktop Client. Click on the Remove button or click the Start button and select "All Programs"->"OP Desktop Client"->"Uninstall". 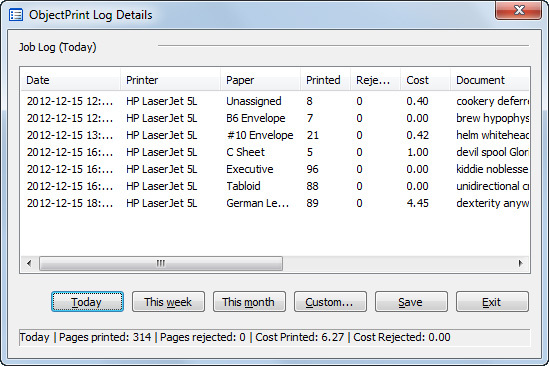 OP Desktop Client shows the name, status, balance, count of pages printed/rejected and the cost. If you have a valid prepaid card, type your set number into the space provided, select the appropriate account and OP Server and click on the "OK" button to update. If you wish to enable OP Desktop Client for this server, check 'Enable OP Desktop Client' in General Settings. Click 'Enable Prepaid cards' to enable prepaid cards.